Over the coming holiday period, I won’t have time to record the usual album episodes. 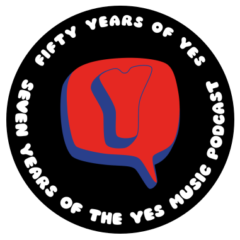 What I’d like to do instead is create a couple of episodes made up of what you regard as the best moments of Yes music – the moments which remind you why you love listening to Yes – your ‘champagne moments’. You can submit as many champagne moments as you like but I might have to select one or two if lots of people get involved – as I hope they will! My champagne moments are all snippets, so not sure how useful they’ll be! For instance .. the cycle-of-fifths finale of Awaken .. “send, ascending to the future” from Homeworld … the joyous first couple of minutes of Miracle Of Life … Chris’s non-stop bass solo on Hold Out Your Hand … Billy’s tour de force that is New State Of Mind … the rapid chord-change trademarks in Future Times/Rejoice, Does It Really Happen and The Calling… I could go on! That’s exactly the kind of thing I want so thanks!! I have many Champagne Moments, but the best is that wonderful 12-string introduction to ‘And You And I’ (and then the whole piece). It never fails to send shivers up my spine and is a high point in every show. I bought a 12-string guitar just to play that piece (had to write some of my own to justify the expense). The original recording was played, by Steve, on Chris’ old Hondo guitar. He introduced Steve to 12-string playing. If you look at Chris’ hands, you’ll see that he’s not built for mere 6-string instruments, bass and 12-string for him. Great moments! Those will be really useful for the episode so thanks! 1. “Roundabout” from the “Fragile” album – every bit of it. 3. In “Your’s in No Disgrace” at 8:00 when Steve Howe launches the last verse/chorus section with that amazing wha drenched guitar riff. 4. “Mood For A Day” (The reason I play classical guitar). 5. The entire “Close to the Edge” album but especially the “I Get Up I Get Down” section and the vocal arrangement at 10:09 that begins with “In her white lace…” and builds up to the creepy Rick Wakeman organ chords. 6. In “Tales from Topographic Oceans” “Giants Under The Sun” after nearly six minutes of manic dissonance, Steve Howe launches into a classically inspired guitar solo and is joined by Jon Anderson who sings: “Do the leaves of green stay greener…” As Kevin pointed out in his podcast: the melodies here seem to be a reward for our patience! 8. On “Tormato” Steve Howe’s acoustic guitar part on Madrigal over a relentless harpsichord line, especially the solos and fills. 9. “Wonderous Stories” from the live “Yesshows” album mainly for Chris Squire’s aweesome bass sound! 12. And of course: “Don’t Kill the Whale” Best all around Yes tune ever – after “Roundabaout”. I’ve surely left out many others but these are definitely some of my favorite moments. Wow, thanks, Mike! Enough for a whole episode! Speaking of “Going For The One” .. I agree the bassline is something special, and Chris’s natural vocal harmonies draw me in every time. Somebody else once said it, but the man was born to sing harmonies! My favourite Yes song of all time is ‘Leave it’! I have many champgne moments with Yes music. But the Most Beautiful was when i´ve gotten a colege job in the florest, studying some Bryophytas i turned on my cell phone and started to play Close to the Edge ! It Was AWESOME, have listened that intro and see the sunshine above the trees. Well, I see that I am well over two months late in my blog post for the “Champagne Moments” for Kevin’s YesMusicPodcasts. I only discovered this Podcast a week ago… better late than never! Firstly I would like to say I am not the average Yes Fan. I didn’t get into the band until 1994 (I was 14) at the release of the TALK album, so my classic era of the band is different than the status quo of Yes-Heads. I must say that I am a true die hard fans and I KNOW EVERYTHING of the history of this band. Go ahead and quiz me. I dare you. Anyhoo’s, I love Kevin’s show and am obsessed with trying to catch up as of late, thought I’d give my un-asked for two cents in the “Champagne Moments” of Yes. For the record, I have seen Yes live in concert 17 times since 1994 and I own a great deal of every lineup’s memorabilia and all the members and ex-members solo albums (not bad for being only 32!)…. 1. Intro to “MIRACLE OF LIFE” – Simply stunning. That was my first “Ah-ha” Yes moment, I was 14 in 1994. 2. All of “ENDLESS DREAM” – Pure brilliance. 3. “LOVE WILL FIND AWAY” – :’) ..sorry to you ‘long-in-the-tooth’ fans… I stand by this decision. 4. The church organ section with the Moog build up near the finale of “CLOSE TO THE EDGE” – You know why, silly. 5. The 3/4 sections of “ARRIVING UFO” – would love to have been in the studio watching them come up with this! Mind altering substances, I fear. I know it’s not the norm of lists. But I am not the norm. Kev, if you’re reading this, you need to have me on your show… there is no better Yes Expert than I. Period. Hi Scott – it’s great to meet another true fan and I’m so glad you are enjoying the past episodes of the podcast. When we get round to having a quiz (as I hope we will one day) then you will be first choice for quiz master! Fantastic to have your Champagne Moments for all to see here and I will keep your offer of appearing on the show in mind as I plan my way forward – I’m sure there will be an opportunity at some point soon. Keep listening and thanks so much for the kind words. the section of SHOCK TO THE SYSTEM, “Dreaming all the time…” …beautiful. Previous Previous post: Interviewed on Twilight Guitar!